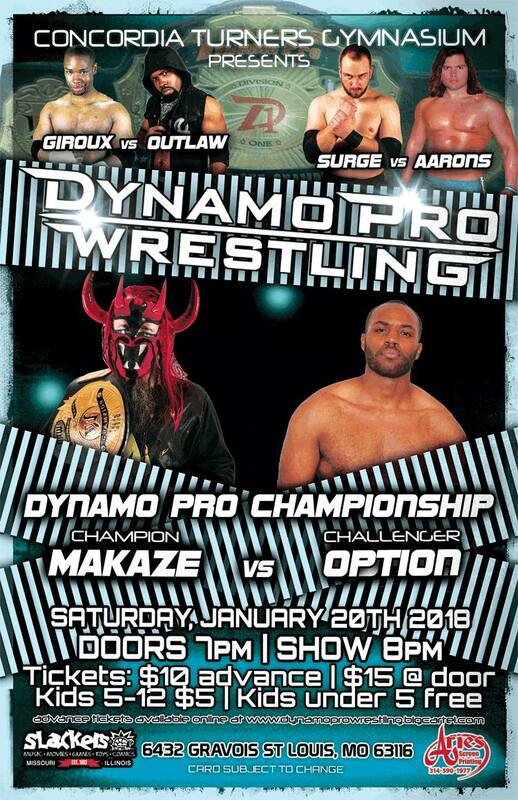 Dynamo Pro Wrestling returns to Concordia Turners Gymnasium January 20th! The event titled "A New Beginning" will feature two qualifying matches for the D1 Championship tournament, and Makaze defending his Dynamo Pro Heavyweight Championship. We also can't forget the hottest match to hit the twitter since Rock and Cena, "Hybrid Ace" Jon Webb vs Snitch. Makaze faces his toughest challenge to date when he takes on Keon Option for the first time in singles action. Makaze has been on a blazing path ever since taking the championship away from Brandon Aarons. What is in store when he steps toe to toe with Keon Option? It has been announced on Dynamo Pro social media this past week that in late October 2017, "Unbreakable" Michael Elgin relinquished the D1 Championship due to many international commitments. To crown a new champion, Dynamo Pro is holding six qualifying matches. From the qualifying matches, the six winners will then go on to a 6-man scramble ladder match. The first two qualifiers have been announced recently and I don't think Dynamo fans will be disappointed in this tournament. The first match features Mike Outlaw returning to face a debuting Hollis Giroux. The second match features former Dynamo Pro Heavyweight Champion Brandon Aarons taking on "Lights Out" Adrian Surge. These are just the first two of six qualifiers, with the remaining left unannounced at this time.